One of the most interesting aspects of running a high-touch Beta program is learning what smart, creative people can do with our software. We opened the Edge2Web on MindSphere Early Experience Program (EEP) in mid-May and are very excited by the kinds of apps people are building with Edge2Web Director – live equipment dashboards, OEE monitors, supply chain apps, among several others. We thought this was a pretty cool idea so we assigned it to Anthony, our super-smart QA intern, who immediately jumped in with both feet. 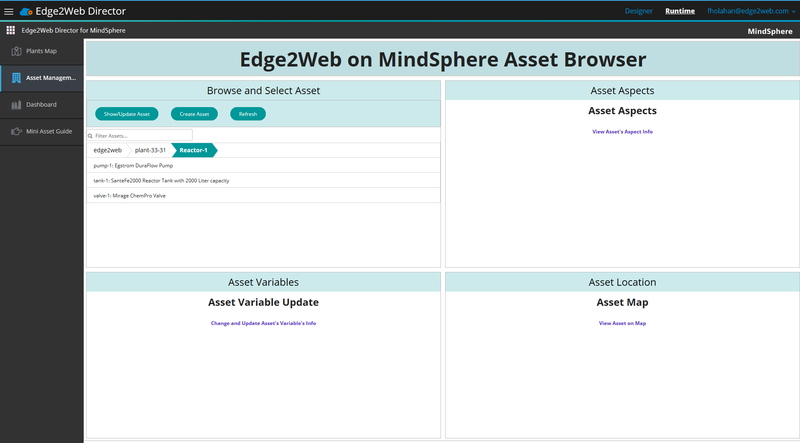 In his first iteration, Anthony created a handful of components using Edge2Web Director for browsing and updating MindSphere assets. The first cut of his Asset Browser app looks like the screenshot in Figures 1 and 2 below. Figure 1 shows the app when it’s first loaded – the Browse and Select Asset cell provides a browser that allows the user to easily locate a desired asset. The other cells are blank because an asset is yet to be selected. The user “walks” the asset hierarchy and then hits the Show/Update Asset button. As shown in Figure 2, data for the selected asset is then displayed on the page. There are a few things going on in Figures 1 and 2 worth mentioning. First, if you look closely, you will see that the Browse and Select Asset cell changes based on the user’s context. It initially provides browsing functionality, after which the browser screen is replaced by a top-level view/edit screen. Under the hood, that component is actually a multi-screen flow built in Edge2Web Director’s flow editor (without programming). Each display screen in the flow has its own navigation buttons, allowing the user to easily flip between asset browse mode and view/edit mode. Also, the asset ID brought back from browse mode is automatically used to drive all of the other page components. Pretty cool stuff. The next point of interest is updateability. Users of this app can easily edit asset data directly within MindSphere. This is a very handy feature when provisioning and managing a large fleet of Mindsphere assets. The final interesting feature is baked into the Asset Aspects component (upper right page cell). Our sample data has a single aspect called Reactor, and it has a corresponding table of variables (in MindSphere terminology, variables are things that actually get measured, such as heat, volume, temperature, etc.). Anthony chose to display those variables in a 5-row data table. Edge2Web’s data table renderer automatically generates the counter and nav controls below the table. Here’s the really cool part – since the data table is, itself, embedded in an Edge2Web flex list, a separate table will be generated for each aspect of the selected asset (a vertical scrollbar will appear in the cell for assets with more than one aspect). The asset in the screenshot only has one aspect, so we don’t really see the flex list’s full power, but it is among the most exciting features in Edge2Web’s growing renderer portfolio. Where will we go from here with this POC app? 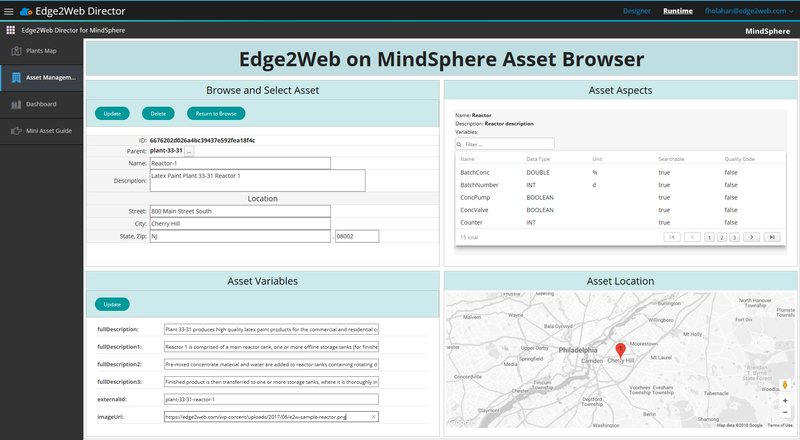 In collaboration with our EEP colleagues, we aim to enhance the MindSphere Asset Browser app in the coming weeks. Our goal is to provide a useful tool for managing MindSphere agents, assets and data. So stay tuned!